- Setting policies with regard to the energy conservation and to exploit the advantages of its resources in Palestine. 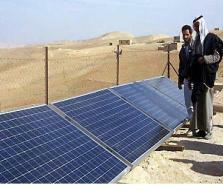 - To start laying out plans and special studies related with Palestinian rural electrification (solar and wind energy). - Establishing test labs to select specific equipment’s in renewable energy in particular, solar and wind energy. - To exchange experiences at locally and international level with institution and research centers in renewable energy fields. - To participate in seminars, workshops at local and international level. The Gaza Strip is a narrow strip stretches along the east-south corner of the Mediterranean Sea , 40 km long and between 6 and 12 km wide. It lies on Longitude 34o 26` east and Latitude 31o 10` north of the equator. The total area is estimated at 365 km2 . The Gaza Strip is highly populated with an estimated population of 850,000 and can be divided into major cities, refugee camps and villages. The average population density is 2330 person / km2 , while the highest, which is registered in the camps can be 100,000 person / km2. The Gaza Strip is categorized as tropical region with a relatively hot summer and mild winter. The average daily mean temperature ranges from 24oC in summer [May-August], to 15oC in winter [November-February] Fig.(1). Average daily maximum temperatures range from 27oC to 19oC and minimum temperatures from 21oC to 11oC, in the summer and winter respectively. The daily relative humidity Fig. (2) fluctuates between 62.5% in the daytime and 83.4% at night in the summer, and between 51.6% and 81.3%, respectively, in winter. Gaza Strip has a relatively high solar radiation. It has approximately 2861, annual sunshine -hour sunshine throughout the year. The daily average solar radiation on a horizontal surface is about 222 W/m2 (7014 MJ/m2/yr). This varies during the day and through out the year Fig (3). Illustrates the variation in the monthly daily average in total insolation on horizontal surface for each month. Domestic solar water heating (SWH) is widely used in Palestine, it can be safely estimated that at least 70 percent of houses in Palestine have installed such system. SWH are manufactured locally by more than 15 major workshops in Palestine, 10 of them in West Bank and 5 in Gaza Strip. The currents annul production rate of these workshops is estimated at about 24.000 units, this production rate is sufficient to full fill the local market’s need. It is expected that this market will expand due to significant growth in the building sector. The average cost for typical flat plate solar collector is about 300 $. Solar water heaters have proved to be feasible compared with other alternatives. For example, the energy cost from solar heater is about $ 0.17/Kwh energy much cheaper that the electricity price from the grid, $0.11/Kwh. In view of the importance of these models and its application in providing energy and the high demand for in the local market, and its application over spread in Palestinian territories. Hence the renewable energy department in PEA, made the major priority in which it has been coordinated with the Palestinian standards institution in industrial ministry for the efficient performance, and to unified models and special stander, in solar models however it has been signed agreement between the two institutions for establishing test lab for the efficiency and performance to all types of models. Inspecting part of the new school solar array is Mr.Mahmoud Al-Majada(left).He commented that this solar power plant is the fulfillment of great dream held by the village Council for leaping into the 21st Century at full speed. The average electric lead in a clinic amounts to approximately 2.4 Kw/day, and is utilized for lighting, medicinal refrigeration and the operation of medical testing equipment. Since a large number of clinics located in remote villages have no electricity at all, such electricity loads can be easily and reliably covered by a small PV generator with a peak power of only 400 W and a storage battery black capacity of 7.2 Kwh . This alternative was applied to nine clinics in remote villages in Palestine, and proved to be a viable solution in such cases.